New Disease Reports (2003) 8, 24. Queensland arrowroot (Canna edulis) is a herb cultivated in various parts of the tropics for its edible, starchy, tuberous rhizome. The starch is easily digestible and is particularly used as food for children, invalids and convalesing patients. The waste product of rhizome after the extraction of starch is used as a soil improver. The bakery products prepared from canna starch are much lighter, spongier and crispier than those from wheat products. During December, 2002, Canna edulis plants at the Central Tuber Crops Research Institute, Kerala were found to be infected with a rust fungus. The pathogen produced numerous small yellow powdery pustules, primarily on the lower surface of the infected leaves (Fig. 1) and a corresponding small yellowish lesions of 1-2 mm diameter were seen on the upper surface (Fig. 2). In advanced stages of infection, the upper leaf-surface spots coalesce, turn dark brown-to-black and finally the infected leaves become dry and fall. Microscopic observations revealed the uredinospore rust stage. Uredinia were hypophyllous, subepidermal, erumpent, dark yellowish, circular to irregular in shape. Urediniospores were light yellow in colour round to ovate in shape, echinulate and 25-35 µm x 15-20 µm include wall thickness. The hyaline wall had an obscure germ pore (Fig. 3). 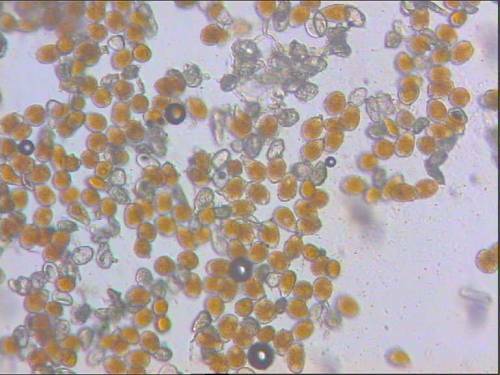 The pathogen was identified as Puccinia thaliae (HCIO. NO. 44.744). A reference sample has been deposited in the Herbarium of the Indian Agricultural Research Institute, New Delhi. This is the first record of P. thaliae infecting C. edulis in India.Literature searches show that there are no previous records of this disease from India (Bilgrami et al, 1991; Butler, 1997). 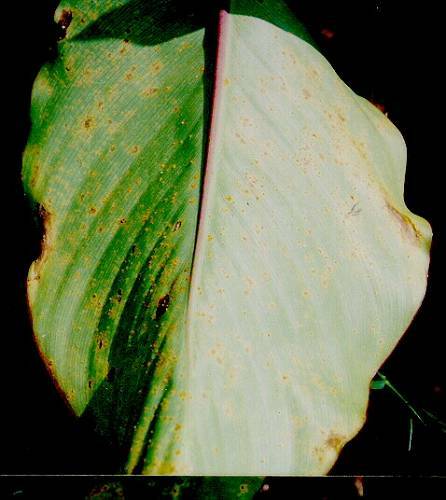 Bagyanarayana & Ramesh (1999) reported Puccinia cannacearum, another rust fungus on Canna indica from India. 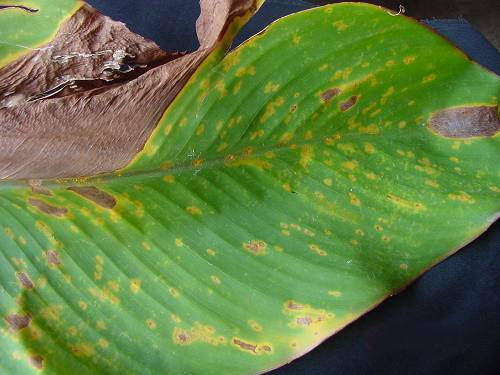 The only previous report of P. thaliae infecting canna is from Hawaii on Canna indica (Gardner & Hodges, 1989). Bagyanarayana G, Ramesh A, 1999. Puccinia cannacearum, a new rust taxon on Canna indica. Indian Phytopathology 52, 98-99. Bilgrami KS, Jamaluddin, Rizwi MP, 1991. Fungi of India 11th Edition. New Delhi, India: Today and Tomorrow's Printers and Publishers. Butler EJ, 1997. Fungi of India. New Delhi, India: Biotech Books. Gardner DE, Hodges CS, 1989. The rust fungi (Uredinales) of Hawaii. Pacific Science 43, 4155.